This beautiful print is available as a 26″ wide by 18″ tall Master Giclée Edition with Inaugural Seal. For additional sizes or print options please send us an enquiry. Thank You. Magnificently suited to survive in a harsh environment, Longhorns are unique among cattle. 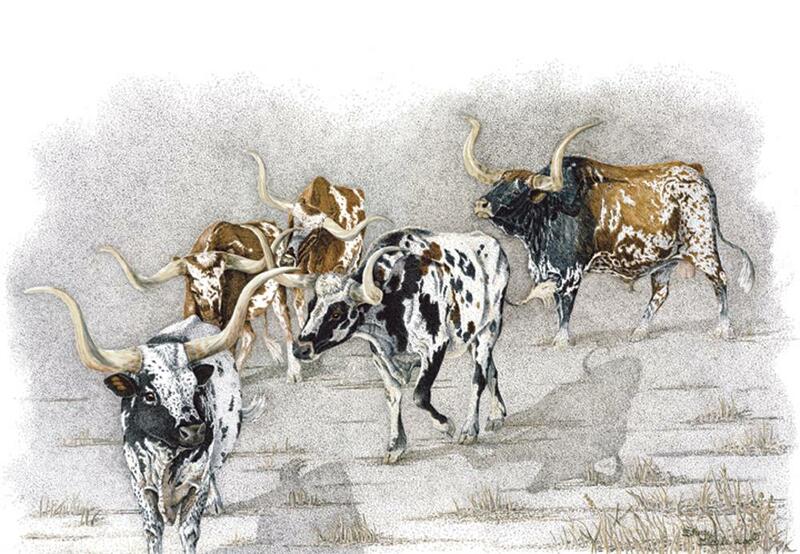 The tough survivors developed spotted hides for camouflage, efficient processing of sparse vegetation during droughts, and long horns for thrashing free from thickets of mesquite. Male Longhorns don’t really grow their longest sets of horns until after they are castrated. If it is done before they are 2 years old, then the base of the horns will stay smaller and the strength of the hormones goes into the length of the horns. The bulls, on the other hand, maintain a massive base to their horns and a bulk to their massive bodies for battle and breeding.